In this rather hilariously ostentatious design, a golden viola is being grasped in a pointedly highlighted fist alongside an alto clef emblazoned, red grasping winged mythological creature. 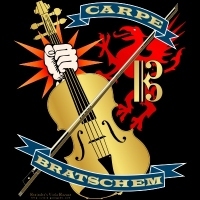 This pseudo-heraldic spoof features the pseudo-Latin slogan “Carpe Bratschem” (Seize the Viola!) This makes a great gift for that violist in your life with the bizarre sense of humor! You can seize the opportunity to buy this design now on a t-shirt, hoodie, mug, tote bag or other quality gift exclusively from Bratsche’s Viola Bazaar!